WHAT IS A GRAND FUNDO? In the cycling world, a gran fondo is a massive group ride that can attract thousands of cyclists of all ages and abilities. 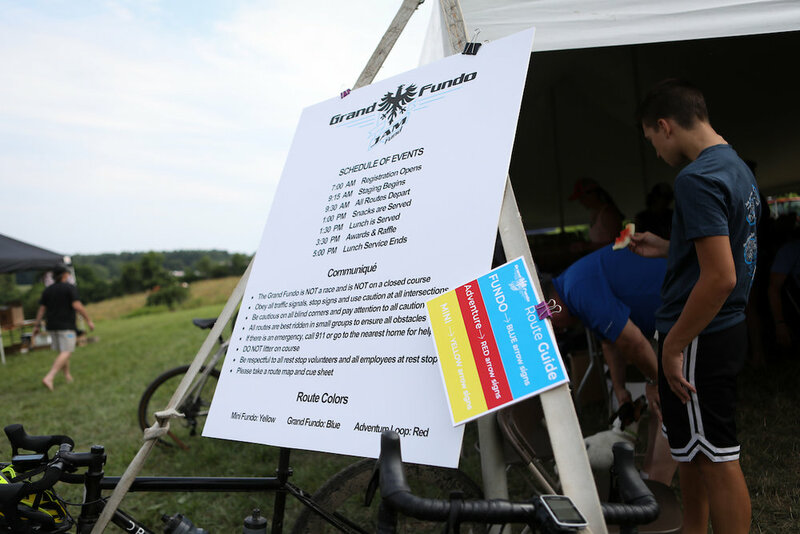 We call our event the Grand FUNdo because we think it will be the most fun bike ride you’ll have this season. Please get to the Glendale Ridge Vineyard by 8:30 a.m. so you can park, sign your waiver and pick up your raffle tickets before we ride. The ride starts at 9:30 a.m., so if you get there with plenty of time to park, you can hobnob with friends before we take off for a beautiful day of riding. HOW DO I GET TO THE FUNDO? The start and finish of all rides are at Glendale Ridge Vineyard, 155 Glendale Rd., Southampton, Mass. 01073. Absolutely! We've partnered with BikeFlights.com to make it easier for you to ship your bike to our event. Just go to this link. Anyone who regularly rides a bike enough to finish at least 39 miles. Yes! All riders receive cool stuff! JAM Fund Co-Founder and Four-time U.S. National Cyclocross Champion Jeremy Powers, who is our awesome course designer, will lead out the FUNdo with JAM Fund team riders and friends. Jeremy aims to shake hands with every rider in attendance! 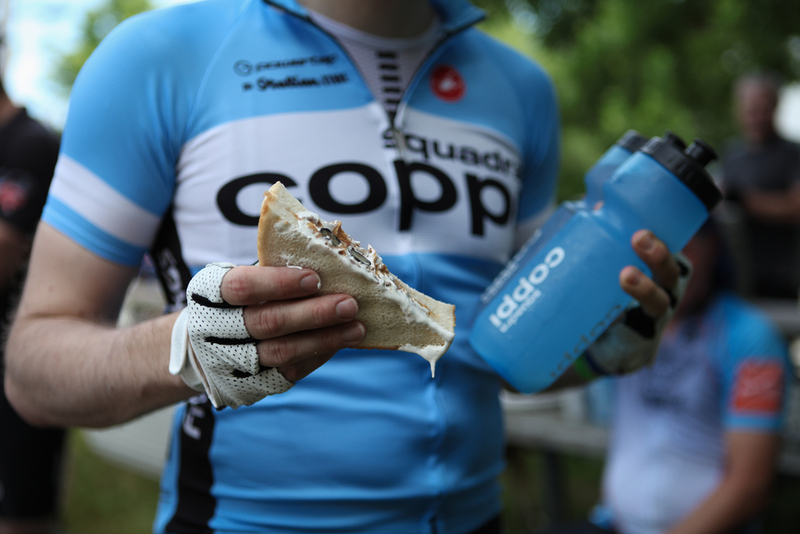 Most of our riders are average cyclists like you. Of course, you may see other lifelong members of the JAM Fund Family including three-time U.S. National Cyclocross Champion Stephen Hyde (Cannondale/CyclocrossWorld), U23 Cyclocross National and World Champion Ellen Noble (Trek), Anthony Clark (Squid Bikes), Jeremy Durrin and maybe even U.S. National Criterium Champion Brad Huff (Rally Cycling). 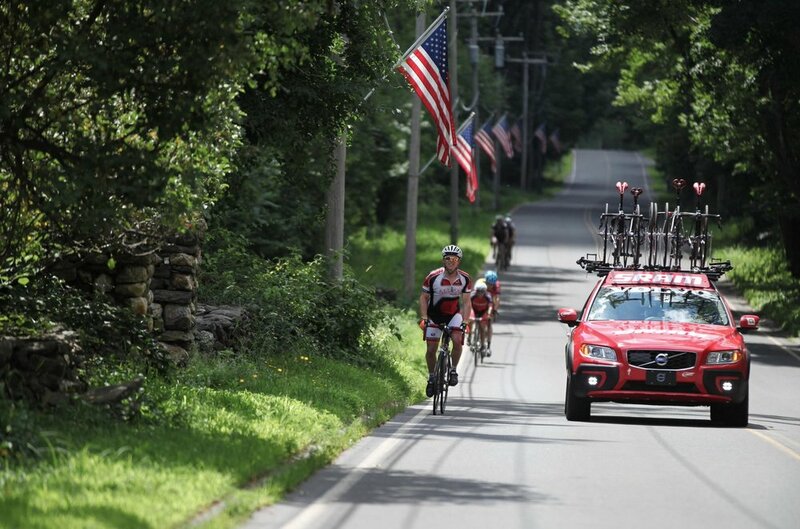 In the past, our pro guests included Tim Johnson, Ryan Trebon, Gabby Durrin, Phil Gaimon, Ted King, Ben Wolfe, Mo Bruno Roy, Jamie Driscoll, Lyne Bessette, Olivia Dillon, Kevin Monahan, Emerson Oronte and Mike Creed. 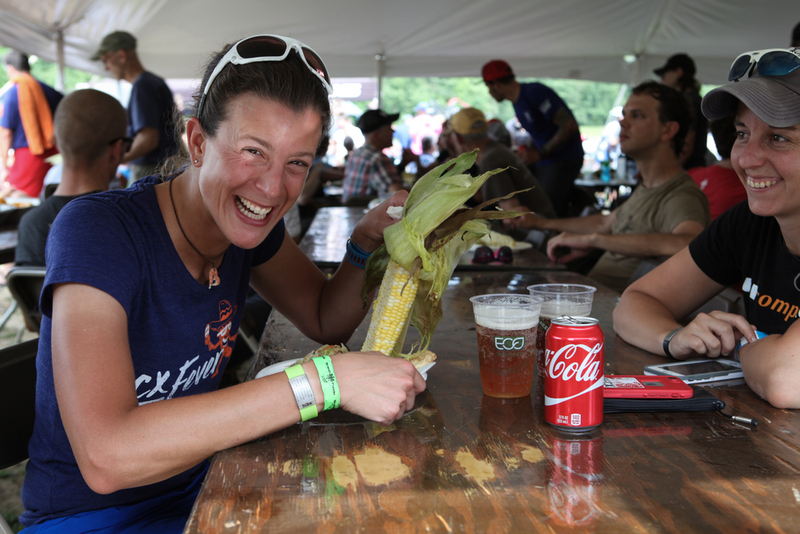 There are always familiar faces who show up to the FUNdo! Yes! We have several rest stops stocked full with snacks and Fluffernutter sandwiches. 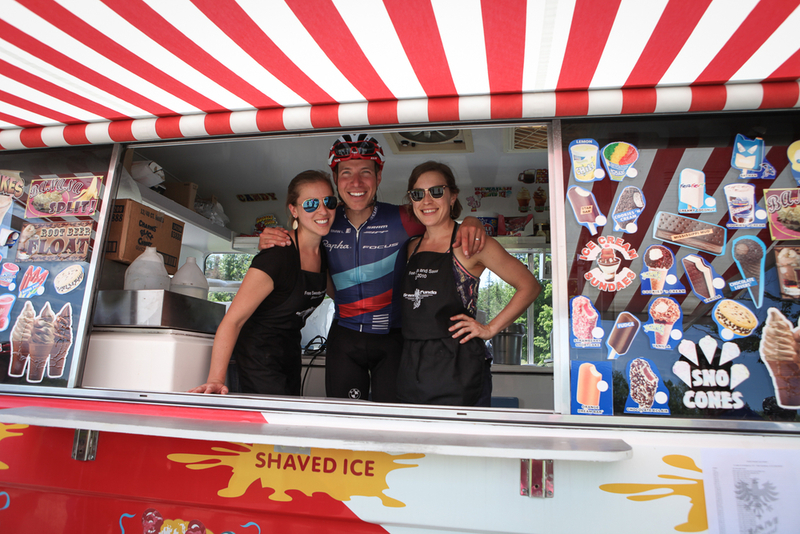 At mile 32, you can grab a refreshing cone at our ice cream truck. Technical support is provided by SRAM in vehicles with mechanics, tubes, tires and other supplies that you may need to finish the ride. We also have a sweep van to pick up any stragglers. For the FUNdo loop, we recommend a road or cyclocross bike with flat resistant tubes and any tire over 25c wide (preferably 28c). For Adventure riders, we highly recommend a cross bike with 35c+ tires. You could ride a mountain bike on the Adventure Loop, but that's not ideal since there are still plenty of road sections on that route. Everyone should bring their own tubes and tools just in case. There is SRAM support on the FUNdo route but not on the trail sections of the Adventure loop. How hard is the ride? How long will it take? Our classic Grand FUNdo route is a challenging 67.5 miles, perfect for seasoned riders and should take about four hours. The shorter 40-mile Mini Fundo should take about three hours. The 65-mile gravel Adventure loop is a tough one and recommended for riders who have prepared for steep climbs and descents. The Adventure should take about five to six hours. Is the route available for download? IS THERE a post-ride party? Yes! After the rides are over at about 2:00 p.m., we’ll celebrate with a feast at the Glendale Ridge Vineyard, the spot where all the rides start and end. We'll have plenty of food including our marinated chicken, grilled tofu, roasted veggies, corn-on-the-cob, watermelon, beer and more ice cream. All of that is included in the price of your ride registration. There's also our awesome raffle where you can win great prizes from our sponsors, and our Grant Awards Ceremony. Buy a raffle ticket or two when you register for the FUNdo. Is there a vegetarian option for dinner? Yes! The food crew will prepare vegetarian options for lunch, so if meat isn't your thing, we'll have alternatives such as the grilled tofu and veggies. There will also be plenty of snacks, side dishes and drinks. If you have particular dietary needs, please contact us ahead of time and we'll do our best to address your concerns. The route is clearly marked with large signs and arrows. Red marks the Adventure Loop, blue is for the classic FUNdo and yellow is the Mini FUNdo. No rider will be left behind; support riders will help you and a van will sweep the course at the end of the day to pick up riders unable to finish. There is no mechanical support on the Adventure loop trails, so please bring your tools. All the proceeds from the event go to the Jam Fund program, devoted to helping young, enthusiastic cyclists become professional athletes. It's easy! Go to BikeReg and make sure to buy a raffle ticket!